MAINLY BASED on the work of the Belfast photographer Robert J Welsh and some of the images from the collection of James Tuke in the National Photographic Archives in Dublin, the photos and accompanying analysis in this book show the Irish in field and factory, in fishing boat and shore line during the period 1890 to 1920. We see in these period colonial photographs a social history of survival during a period when the Irish were mainly excluded from lucrative forms of employment. Pictures of women working in the fields and men curing fish for export tell a story, as do the clothes they wore and the working implements they used. Pictures of thatched cottages in the Claddagh give us a glimpse into the state of housing and village life, as the picture of a young bare foot girl selling turf tells us about the price of shoes and a means of income, demonstrates. The sullen faces of young girls in a lace-making factory tell their own story, as do all the pictures in this excellent collection. 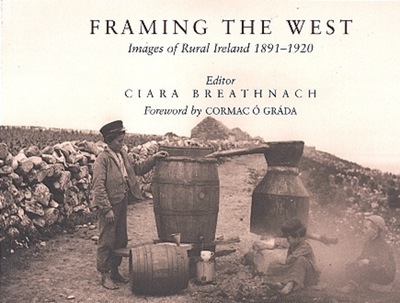 Fourteen contributors write on a variety of social subjects, with accompanying photographs, covering work, education, poverty, cloths worn in that period etc. All reveal a wealth of information for social study. The activities of colonial philanthropists of the time published by patronising newspapers are a great source for historical analysis and are used here aptly to explain why the photographs were taken and the use they were put to in that period. Perhaps this book should have been called 'Reclaiming the Past', a process that any ex-colonial country has to go through and this book is a positive contribution to that process. This document was last modified by David Granville on 2009-01-23 11:10:57.